Robert Carty is an electronic ambient and space musician hailing from Utah in the United States. For the better part of two decades, Robert has been producing cosmic electronic music that delights the senses and teases the imagination. His work spans a diverse body of forms, with styles as varied as tribal ambient, new age, Berlin school electronica, planetarium music, ambient soundscapes and even film music. His work is profoundly visual and focuses on leaving a sense of peace in the listener. He has been influenced by such artists as Jonn Serrie, Klaus Schulze, Jon Anderson, Giles Reaves, Vangelis, Steve Roach, Tangerine Dream, and many other artists. His work was described by Eric Meece as "... somewhere amidst the darker and more spare or ethnic sounds of Roach, the smooth misty music of Serrie, the deep sensuous spiritual sonority of Parsons, and the bright esoteric spirituality of Michael Hammer." 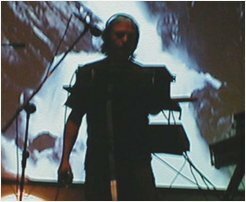 Robert has been played and featured on a large number of radio programs, including Hearts of Space, Star's End, Secret Music, Ultima Thule, and StillStream.com. Earth Mantra is very proud to bring the music of Robert Carty to our listeners, and hopes to hear much more from him in the future.